Ooh gurl, it's all kicking off on Twitter. In the never ending saga of Naughty Boy, One Direction, Zayn, Directioners and everyone, there's some more drama to add to the fold. It seems that Zayn isn't too happy about an apparent new video that has surfaced online of his cover of Rae Sremmurd's "No Type". 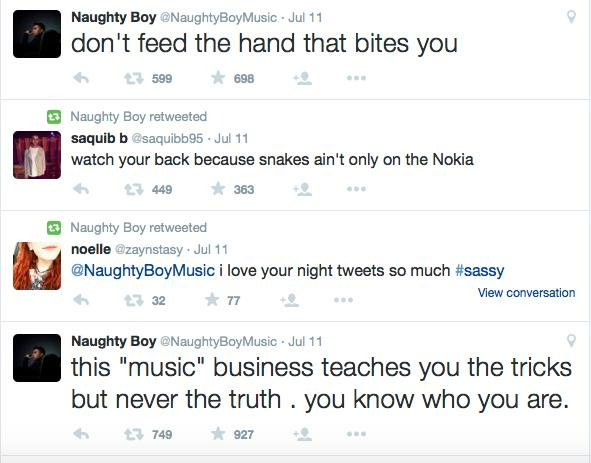 The move comes after Naughty Boy tweeted and re-tweeted some pretty cryptic stuff over the weekend. Maybe Zayn has been hacked? Maybe him and Naughty Boy have completely fallen out? Maybe they're just trolling us all *grabs popcorn*.